The Best Stand Up Paddle Boards | Wow. Top-Rated and Reviewed for Sale. The best surf, flatwater, and all-around paddle boards for sale. Searching for the best “stand up paddle boards?” Writing and researching an article that helps people find the best paddle boards for sale was one of the most fun things we’ve written so far. After all, we this gave us an opportunity to hit the open water and check out some of the latest types of paddle boards such as: Surf, Flatwater, Whitewater and All-Around Paddle Boards for lakes, rivers and oceans. Stand up paddle boarding has taken the outdoor industry by storm. Every year, more and more outdoor enthusiasts are turning to the sport. In 2019, the Outdoors Foundation found that more than 3 million Americans went “SUPing,” an increase of 2 million from 2010. Now, as the sport becomes more and more popular, new products are on offer as SUPers get more adventurous. Best Surf Paddle Boards – Surf boards are designed for cutting through waves. They tend to be shorter than All-Around boards, which increases their maneuverability in turbulent waters. You can take on any river or ocean with these paddle boards. Best All-Around Paddle Boards– All-Around paddle boards wider, longer boards that provide great stability. These boards are great general purpose boards. You can use them for leisure paddling and touring, and they do OK in surf conditions. 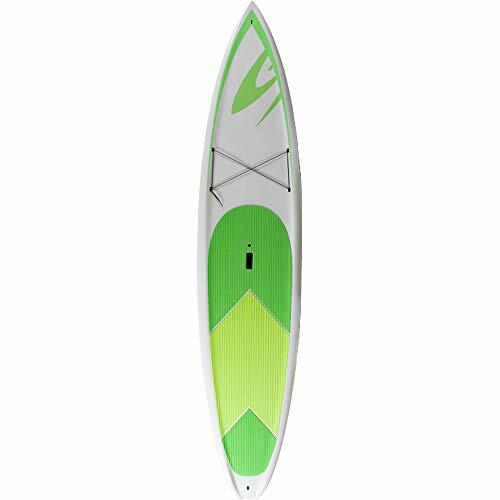 Best Touring Paddle Boards – Often called flat water or fitness boards, these boards are built for long-distance flatwater trips. They tend to be narrower, have displacement hulls and pointed noses, which allow you to cut through water and move faster. Racing boards are a subcategory. Racers are much narrower, which makes them nimbler but more difficult to balance. Best Whitewater Paddle Boards – This category continues to grow, and there are many different varieties. But commonly, whitewater SUP boards are super-wide and thick, which gives them excellent stability in rough water. They may be more egg-shaped than a traditional board, and often they’re inflatable. Think you know which type of board you’re interested in? If you’re new to SUPing, you might consider a great all-around board. Or if you have a specific pursuit in mind, you might choose one that’s tuned to the adventure you’ll be using it for. Looking to ride the waves? Pick up a surf-ready SUP. These three boards offer great maneuverability, innovative designs and quality construction. 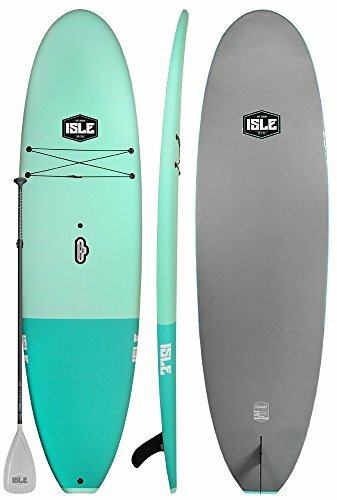 BEST PADDLE BOARDS FOR SALE. OFFICIAL REVIEW OF SURF, FLATWATER AND ALL-AROUND BOARDS. Boardworks produces high-quality inflatable and solid paddle boards. And if you’re looking for a surfing SUP, the Kraken hits all the right notes. It’s lightweight, nimble and has a super-sleek design. What’s great about it: the board is built with a full rocker, which enables you to glide over the waves with excellent control. In terms of fin layout, you have three options: A single center, tri-fin or quad-fin layouts. Plus, the construction couldn’t be better. The Kraken features an EPS foam core, with a fiberglass shell and bamboo veneer. A super-soft honeycomb deck pad adds great traction too. Weight Capacity: up to 290 lbs. Pros: Perfect for small to medium waves. Quality construction. Great glide. Cons: Not tuned for catching big waves. The board tracks a little to the sides. Final Verdict: The Kraken delivers exhilarating riding for intermediate and expert surfers, alike. And it’s a board that’s built to last. >> Learn how to buy the #1 rated Paddle Board in America! Looking for a wave runner that’s super portable? This is your rig. The Hala Playa is built for hauling into the backcountry for some river surfing. And it works well at the beach too. There’s a lot of great design features. The board has a full rocker and slim rails, which provides excellent footing and supreme maneuverability. Plus, the Playa’s patented Carbon Construction maximizes rigidity. The board feels closer to a solid board than most inflatables. Ultimately, this board hugs the line between a longer surf SUP and a touring SUP. That makes it super versatile for riders who hit more than waves. Pros: Very portable. 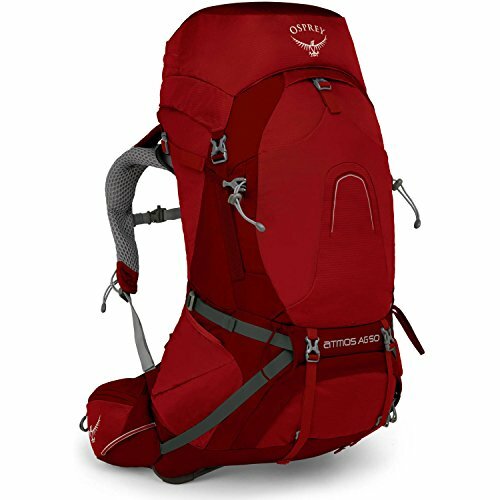 The board inflates in minutes, and it packs nicely in an included backcountry pack. The full rocker has a dramatic slope, which equals great glide. Super cool graphics. Cons: Fairly expensive. A little slow to use as a touring board. Final Verdict: The Playa is a wave runner first and foremost. But it passes as a flatwater board too, making it a versatile purchase. 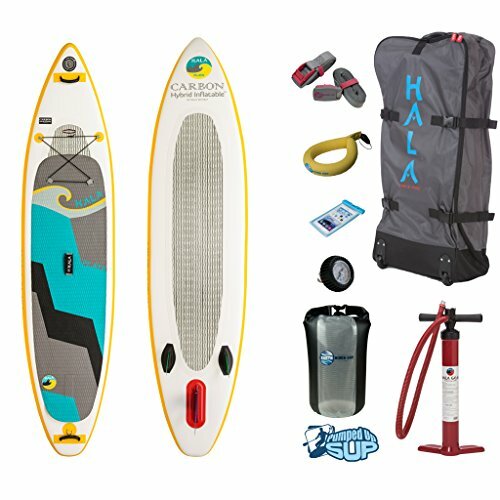 >> Learn how to buy the Hala Carbon Playa Paddle Board. The Cruiser is a soft-top solid board that’s perfect for beginners. Here’s why: the Cruiser has a cushy EVA deck pad, which helps break your fall if you land on top of the board (and that’s something first-timers will experience). Plus, the board is super rigid. That’s great for surf, as it helps the board gain traction in rougher waters. The pop-up handle is a nice touch, making it easy to carry back to your car at the end of the day. And the croc skin traction pad provides excellent footing. 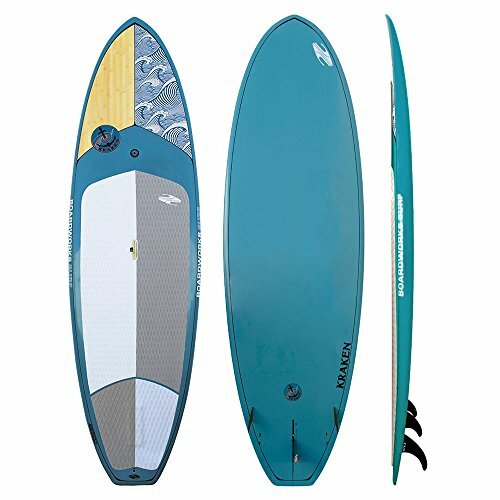 This board hugs the line between surfer and all-around SUP; that’s another reason it’s great for beginners. Pros: Great price for a solid board. Excellent rigidity. And a nifty soft-top design. Cons: Not the most agile. The Cruiser isn’t super optimized for surfing, but it’s still very capable. Final Verdict: The Cruiser does it all: Surf, flatwater paddling, and lazy paddles on rivers, open ocean, or lakes. That’s why it’s the best beginner board. 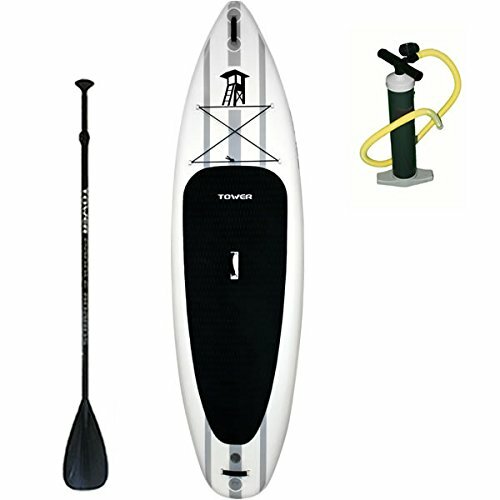 >> Learn how to buy the ISLE Cruiser Paddle Board. All-around boards are perfect for new SUPers who are just getting their feet wet. They do a lot of things great, from flatwater cruising to surfing. Naish calls the Nalu it’s all-around classic. And that couldn’t be a more apt title. This is a versatile board that’s prepped for anything you throw its way. At 11 feet and with a recessed deck and full rails, the Nalu delivers incredible stability. Riders of all levels can handle this bad boy no problem. Plus, decreased volume at the front and rear make maneuverability excellent in all conditions. The construction couldn’t be better. The Nalu features an EPS closed cell core, which is a high-density, lightweight foam. There’s a bamboo sandwich deck, which provides cool woody accents. And the EVA deckpad is super durable and comfortable. Pros: For an 11-footer, the Nalu is super agile. The classic longboard look is a winner. And the recessed deck/full rails make it as stable as rock. Cons: The Nalu has a premium price. Plus, the weight capacity might be pushing it for taller riders. 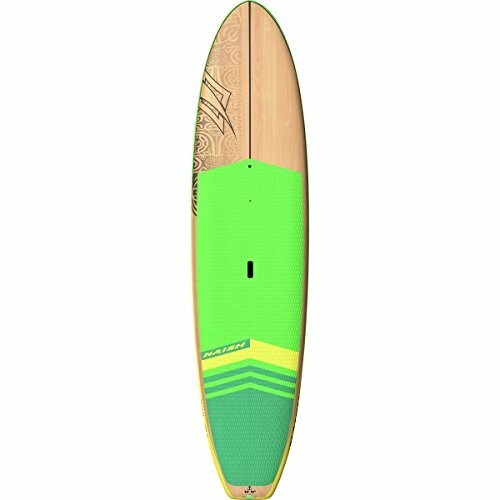 Final Verdict: If you’re looking a board that does it all, give the Nalu paddle board a shot! 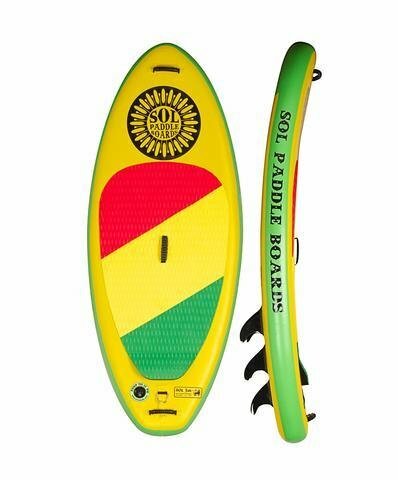 >> Learn how to buy the Nalu Paddle Board. The Atoll is a favorite of many paddle boards, aka “SUPs.” And its following makes sense. This might be an 11-foot board – which makes it feel like you’re cruising on a door – but it’s super lightweight. Atoll’s Fusion Light technology cuts weight by 40%. And really, you’d be hard-pressed to find a board of the same size that’s this light. Plus, at six inches thick, the Cruiser provides super sturdy footing. That’s one reason it’s a favorite for yoga SUPers. You can get into warrior pose without losing your balance. The design is great too. The Atoll features 14 D-rings with bungee tie downs, allowing riders to carry all their gear with them. And the removable 8-inch stock fin (side fins can be added) is reliable. Pros: Super light. Sure-footing in a variety of conditions. And a durable dual-layer PVC design. Cons: The hand pump on this paddle board is a little underpowered. You might want to invest in an electric pump. Final Verdict: There’s a reason the Atoll has such incredible reviews; the board is versatile and the quality couldn’t be better. 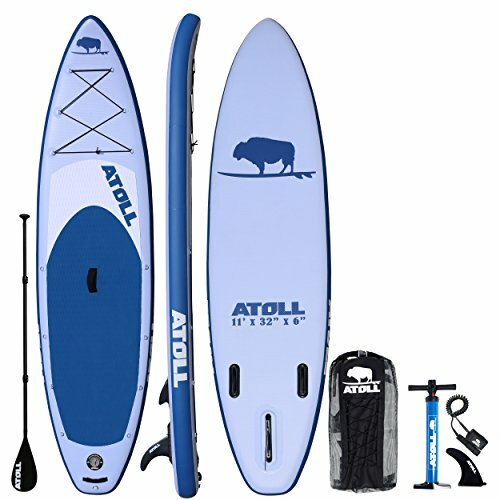 >> Learn how to buy the Atoll Cruiser Paddle Board. BIC, that’s right the lighter company, has a sports division. And they pump out some incredible water sports toys. The TOUGH-TEC Performer Series is a great example. This longboard is the perfect cross between a cruiser and a surf-ready board. It has a moderate rocker profile, that makes it glide over calm waters but agile in the waves. 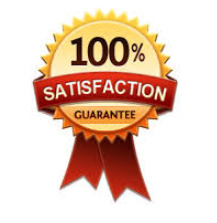 Plus, it receives high marks for quality. The TOUGH-TEC is a hard board that features an EPS foam core with a durable poly skin. The board features a rail saver, which protects the rails. And it has a nice classic longboard shape. This board looks the part. Pros: Solid construction. Three times stronger than previous versions. Rail-to-rail volume, which makes the entire deck stable. Cons: Somewhat slow for long-haul flatwater paddling. Deck footing can wear on bare feet. The BIC TOUGH-TEC is affordable and versatile; a great introductory board. >> Learn how to buy the BIC Tough-Tec Paddle Board. Flatwater or touring boards are perfect for long-haul adventures. If you’re headed to Lake Tahoe, you should bring a flatwater along. The Adventurer 2 paddle board improves upon its predecessor. It’s faster than the original and a bit longer. But it has that same great minimalist design. The Adventurer 2 has a classic black-on-white look that’s super clean. This board is a faster flatwater, even if it is an inflatable. The stereotype is that inflatables drag more than their solid counterparts, but that’s not the case here. The Adventurer 2 flies. This board has the right shape and profile for touring just about anywhere. Rivers, lakes, open ocean – the Adventurer 2 performances competently. And its innovative drop-stitch construction makes this board supremely rigid. Pros: One of the faster inflatable touring boards available. Cool look. 2+1 fin layout. Cons: The handpump isn’t great. You’ll need to upgrade to an electric. And the stability is just OK. Beginners will take some time to get their balance on this board. Final Verdict: If you’re looking for a touring board, but don’t have the storage space for a solid deck, go with the Adventurer 2. Looking to cut across flatwater quickly and with ease? You need a board like the Saber. It’s tuned for speed. The Saber has a narrow profile, a classic displacement hull, and it’s super long. The result is a board that flies through the water on long-haul trips. There’s plenty to love about the design, too. The Saber has a recessed deck, which helps to boost its stability. And the three-quarters deck pad gives solid footing. Plus, the Saber’s displacement hull – the handiwork of legendary surf shaper Randy French – provides great performance in flat or choppy water. Overall, this board is built for speed. It’s close to a racing board in terms of performance. Pros: Great speed with minimal effort. Four tie-downs for stowing gear. Cons: Stability is a bit challenging; this is a board for experienced SUPers. Plus, the design is a little drab. Final Verdict: If speed is your pursuit, and you have experience SUPing, the Saber will make you happy. The Jimmy Styks brand has wide distribution. You can find it at a lot of the Big Box stores. But that doesn’t mean they aren’t high quality. In fact, Styks boards are super durable and designed for performance. Take a look at the Blue Heron. This broad, brawny tourer is a beast. It weighs nearly 40 pounds and measures 12 feet long and 33 inches wide; in other words, it’s super stable. Of course, the added weight does add some drag. This isn’t the fastest touring board, but still, it’s surprising agile. This is great for long-haul trips on calm waters or fishing excursions. Pros: Super stable. Anyone can jump on this board and ride. Clean, classic styling. Great for beginners. Cons: This board is heavy! At 40 pounds, you won’t want to hike in with this beast. Plus, it could be a bit faster. Final Verdict: The Blue Heron is the perfect board for long, lazy paddles in calm water. >> Learn how to buy the Jimmy Styks Paddle Board. Whitewater paddleboards are built for stability. That means they’re typically shorter and wider than all-purpose boards; they typically more closely resemble surf-style boards. The Corran Streetfighter more closely resembles a kayak than a paddle board. For starters, the Streetfighter features a deep recessed deck. In fact, it has a toe lip that you can use for footing when sticking drops. Plus, the shape provides super stability in the most demanding of conditions. It’s super thick, hollow in the center, and has a weight to it that provides surer footing. In terms of whitewater paddle boarding, the Streetfighter is one of the best. It’s super stable and has some incredible features made just for river runners. This is our favorite whitewater paddle board on the market. An absolutely reliable, fast, and easy-to-navigate paddle board that will make you feel like you are sailing. Pros: Innovative design. Kayak-like features. 30% lighter than most plastic paddleboards. Cons: Fairly heavy; you won’t want to lug this rig far. Final Verdict: The Streetfighter is built for fighting the rapids. It’s burly and strong – a great vessel for Class III-IV rapids. >> Learn how to buy the Corran Streetfighter Paddle Board. With design guidance from renowned whitewater paddler Dan Gavere, the River is a super agile SUP that’s designed for all kinds of conditions. From Class I or II rapids, to Class V, the River is designed to provide sturdy footing no matter how rough the water. That’s helped in part by the super compact design. The River has an oblong shape, measuring 9.5 feet and 3 feet in width. Plus, the 2018 version features an updated rocker that enables it to glide over holes more freely. The croc skin deck pad adds to the great footing. And the board is well constructed. It’s made from military-grade PVC – necessary over the rocks – as well as a patented 6-inch drop-stitch interior core. Pros: Relatively lightweight. Forward cargo area. And super stiffness, thanks to the drop-stitch interior. Cons: Really tuned for river running, but unfortunately, it’s not great for touring or fitness. Final Verdict: Want to run rivers and cut through rapids? This agile inflatable is the board for you. 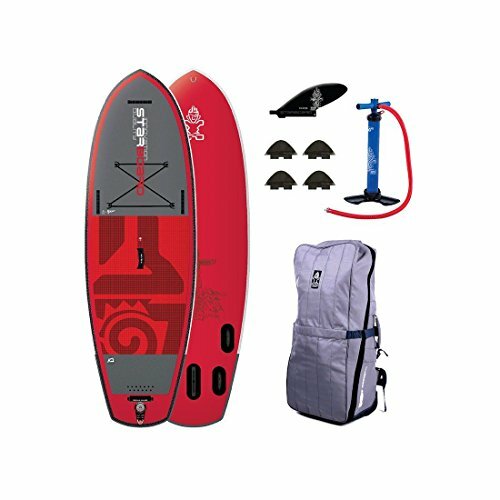 >> Learn how to buy the Starboard River Paddle Board. The SOLjah is part surf-style SUP and part whitewater board. It’s super compact – measuring just 7 feet. And that makes most agile in smaller waves and over holes. Plus, it has a super dramatic rocker, and that helps it glide more freely no matter the conditions. Underneath, the board has a 5-fin layout, allowing you to customize the layout for the tracking you want. Plus, you won’t find a paddle board with more style. The SOLjah’s Rastafarian color scheme will stand out no matter where you go. Pros: Dramatic rocker perfect for rivers and surf. Bold colors and graphics. Awesome footing on this paddle board, and very comfortable for all skill levels, beginner, intermediate, and advanced paddle boarders. Cons: A bit short, especially for taller riders. More of a river surfer than a river tourer. Final Verdict: Pick up the SOLjah if you want a board for the beach and spring runoff. Today, there are numerous options on the market, with new entries coming every season. When it comes to purchasing a board, though, there are a few basics everyone should know. From the size and capacity ratings, to the type of hull you’ll choose, knowing what each of these specs mean can help you make the right choice. Planing Hulls – Planing boards tend to have a wider base, a rounded nose, and tend to have a flatter underbody. Planing boards tend to glide on top of the water. Displacement Hulls – Displacement boards have narrower decks, a pointed nose, and an angular underbody. Displacement boards slice through the water and move more quickly. Boards are designed either with a solid core or an air core. Ultimately, it depends on performance. Solid boards tend to be faster and provide a smoother ride, while inflatable boards offer great stability and are easy to stow away. Solid – Solid boards typically have a foam core that’s wrapped in a fiberglass outer shell. Because they’re solid, they’re usually more durable and stiffer, but also less affordable. Inflatable – Inflatable boards have solid PVC outer shells that wrap an air/PVC core. Most have interior PVC structures that add rigidity when inflated. These are designed to hold air at a high pressure, which gives them a surprising amount of rigidity. They are great if you have to hike into a location, or if you don’t have much space for storage. Shorter boards like surf SUP or kids’ boards tend to be easier to maneuver, but they can be slower. The shorter the board the lower its weight capacity, and surf boards can sometimes be less stable. Medium boards are often used for all-around performance; most all-around boards have mid-range lengths. Medium boards tend to provide great stability, and are used for many different disciplines. Long boards tend to be faster and narrower. Taller riders typically need a longer board, as well. Most racing and touring boards are longer. Volume – This gives a picture of a board’s ability to float when it’s weighted down. Higher volume boards can support more weight. Volume is expressed in liters. Weight Capacity – This is the maximum capacity a board can support. Over-weighting a board will result in drag and greatly reduce performance. Weight capacity is especially important for displacement hull and racing boards. These boards are much more carefully tuned for performance; when they’re over-weighted, performance goes way down. Planing boards, on the other hand, usually don’t experience as much drag, even when you exceed the weight capacity. Excited to pick up your next paddle board? Whether you’re buying your first, or you’re looking for a more performance-minded piece, any of these boards will do the trick. And let us know what you think. Are we missing any of the best boards on the market? 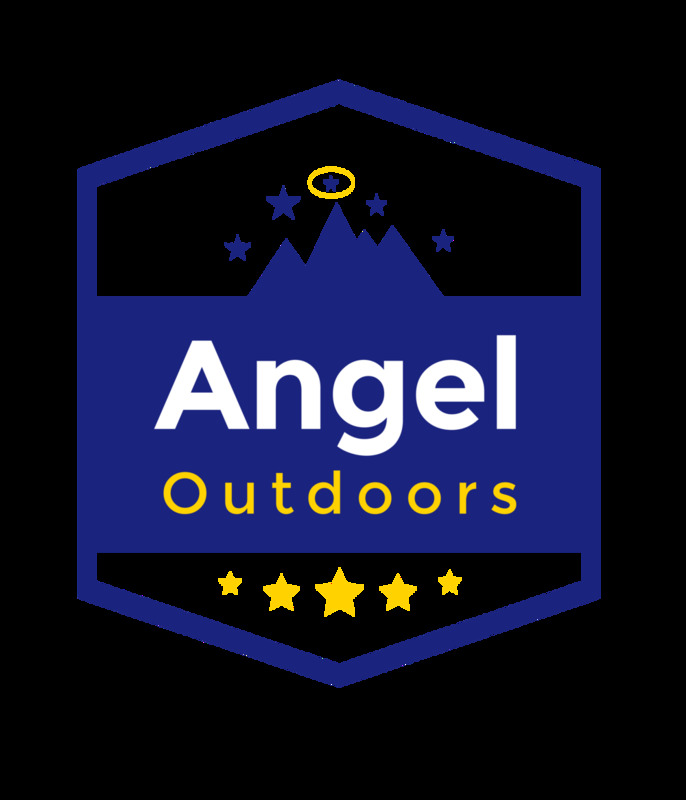 Connect with Angel Outdoors on social media and give us the scoop! We want to hear from you about your experiences with these paddle boards above.